We were at home Sunday morning due to illness and around noon I stepped outside to get something and discovered it was snowing! We bundled the kids up and took them outside to enjoy it. They were awestruck and Lance got the cutest little grin on his face. Out in the parking lot there was enough accumulation on the car to make snowmen. Over Christmas the kids really got to liking snowmen (or at least the pictures and decorations) so when we actually made one it took a few minutes to sink in. 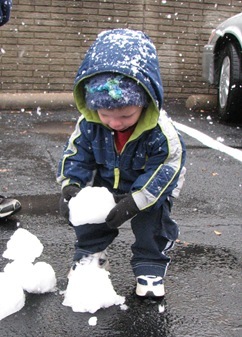 However, they soon got into the process and helped to stack the snowballs we made. Lance would count them “1…2…3!” No matter how many we made he always came up with that number. Finally we made some tracks in the snow. Lance and Ivy walked hand in hand. Good thing we enjoyed it right away because several hours later it was melted! I sat down after dinner to check my email and noticed that you had updated. I quickly grabbed Brian and together we read, watched, and laughed. We both laughed sooo hard over the video!! Hilarious! 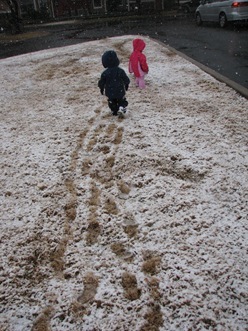 I love how the kids kept going after Mommy with the snowballs. 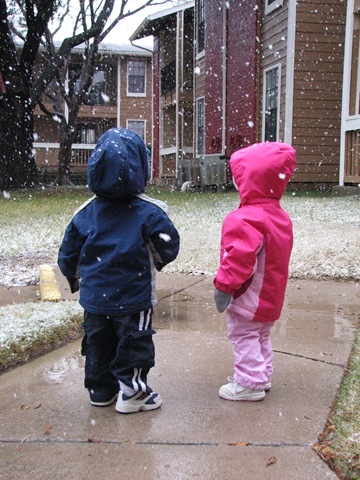 At this rate, it looks like you’ll end up with more snow than we will–especially if it keeps up year after year! Oh my. I laughed so hard watching that video of the kids. Funny how Lance kept heading for Mommy…. I laughed especially hard when Brian hit Lance with one–kind of like shooting fish in a barrel. 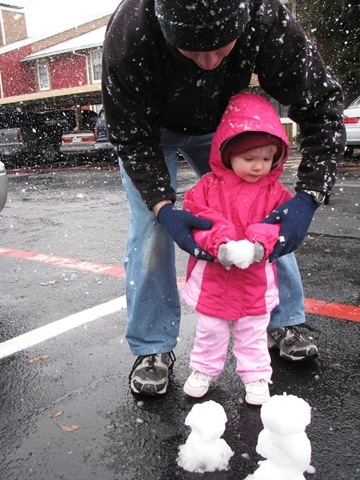 Of course, I’m not so sure that snowball fights are a good thing to teach before they understand that it’s only okay to throw snow and not other things…. Thanks for putting this up, Aim! 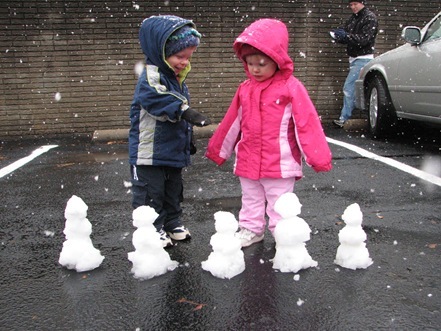 I loved the video, it made me laugh seeing how much fun the kids are having with the snowmen! “No-man is cold.” We got a new snowman ornament for Christmas. 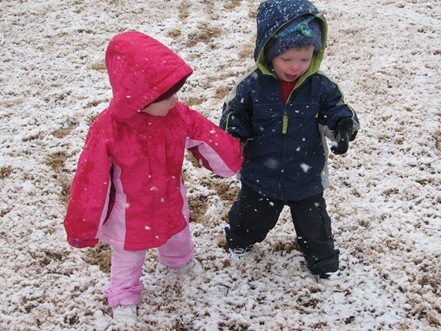 Lucky kids to be able to play in the snow every year. Adorable video. And Lance always has the cutest little grin on his face!